Murlikant Petkar, first Indian to win olymapic level individual gold medal in Paralympics, 1972 in Heidelberg, Germany. Murlikant was born in Kendri village near Sangli, Pune. He served Indian Army as a private Jawan. He used to play boxing before getting injured for Electronic and Mechanical engineering branch of Indian Army. 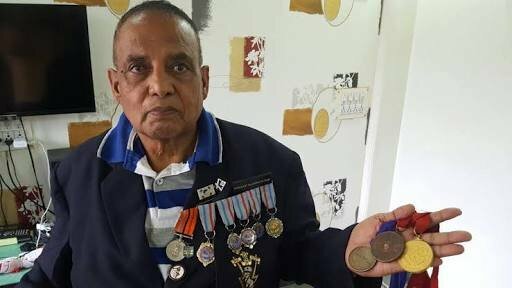 In 1965 during war against Pakistan, he was shot by 7 bullets. One bullet is still lodged in his spine. When the athelete was admitted in hospital for treatment in Mumbai, Mr. J.R.D. Tata came to visit wounded shoulders. He requested him for job rather than accepting monetary compensation. Petkar started working as a supervisor at TELCO, Pune. The bullets left him disabled but couldn’t cripple his spirit. He soon started Swimming, Javelin, Shot Put, Slalom Racing and Table Tennis as a way to recuperate. Just in 3 years he managed to be part of Indian squad of 10 athletes for 1968 Paralympic in Israel. Where he reached in second round of Table Tennis but couldn’t win any medal. The swimmer claimed gold medal and created history by setting world record of 37.331 seconds in 50 Meter freestyle swimming in Paralympics 1972, held in Heidelberg, Germany. In Paralympics 1972, he ended up as finalist in javelin throw, precision Javelin Throw and Slalom. He won 4 international medals in swimming. In 1975, Murlikant was awarded with Shri Shri Chatrapati Award and a pension of 4000 from Maharashtra government. After long time the living legend is getting recognition. Bollywood is going to make biopic on his life. It took 36 years to win Gold in Olympics by any other Indian athlete after him. Abhinav Bindra won gold medal in shooting in Olympics 2008. In 2017, Murlikant Petkar was awarded with Padma Shri (fourth highest civilian award of India) by Government of India.